Questioning whether gravity is strictly attractive. Is there a possibility for repulsion? My thoughts: I knew this was a special case and enquired if it were the case of an ‘absolute vacuum’ to which he said “No. Fluctuations in a permeating field do exist but I don't think that would affect the solution.” This led me to think that absence of any material with the presence of the exact opposite of that would mean something similar to the notion of ‘negative mass’ or rather more similar to ‘relativistic mass’. My conclusion was repulsive(I thought about a little sci-fi G.R with negative mass involved). The vacuums would move apart. He told me that I may have gotten 1 or 2 things wrong but the idea basically stays the same. Anybody can confirm this solution in a better manner? Or perhaps suggest counter-intuitive questions such as this which suggest 'other-wise' solutions? Or perhaps is this question right( I have a feeling this might be wrong due to some missing information)? I think the two vacuums will be effectively attractive. Due to the attractive nature of the gravitation, there will be a pressure on both vacuums to force them merge. (there will be a net force pointing to the right for the left vacuum, and a net force pointing to the left for the right vacuum). I would rather say "effectively", since the force is actually exerted on the masses surrounding the vacuums. you may imagine this is entropic, making them attractive. you may consider the surface tension, merging the two bubbles help to reduce the surface free energy. There will be no atraction or repulsion between the vacuums. Vacuum is the absence of matter which translates into absence of gravitational force (positive or negative). Not the answer you're looking for? Browse other questions tagged forces newtonian-gravity mass vacuum or ask your own question. 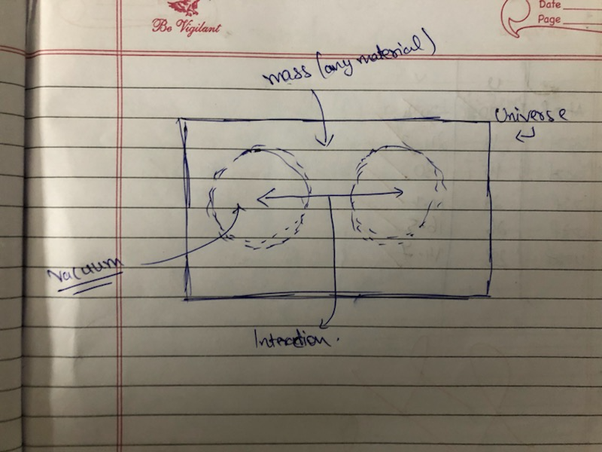 How to explain relativistic mass with 2 moving systems, but not 3? Is it contradictory with any theory or experimental result to have a negative gravitational force mass? How to find static friction coefficient and the applied force's angle of inclination with a horizontal plane? Is there something wrong in my book's derivation of work done on charge? How do we recover units of force from units of gravitational potential?